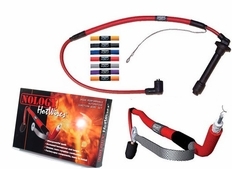 Nology HotWires are the most technologically advanced ignition wires available. Nology HotWires create the most powerful spark possible. You will experience a more complete spark with Nology spark plug wires, resulting in increased horsepower. The increased fuel economy alone, due to the increased combustion, will pay for your new set of Nology wires! Nology Hotwires Spark Plug Wires are engineered with a special patented built-in capacitor and ground. Why is Nology the only company producing these spark plug wires? They hold US and International Patents on the design and technology. This revolutionary design allows energy from the ignition coil to accumulate in the Nology capacitor until the voltage at the spark plug electrodes reaches the ionization point. At that split second point the entire power of the stored spark is discharged at once, creating a spark 300 times more powerful. The result is faster, more complete combustion, and most importantly, MORE HORSEPOWER that's 100% Smog Legal in all 50 states! What's in it for you when you go Nology? Easier Engine Start, Smoother Idle, Increased fuel economy, Increased acceleration, 2-5% increased horsepower, increased torque, higher rpm limits, and lower exhaust temperature and emmisions! These wires pay for themselves! New Level Motorsports is a FULLY AUTHORIZED NOLOGY DEALER. Make sure your warranty is valid and you are dealing with a Nology trusted and approved company.